Katherine Patterson is one of only five authors to twice win the Newbery medal. She delivers powerful, thought-provoking stories, beautifully written with a depth of emotion and meaning. The kind of stories I love, yet I wouldn’t count either of her Newbery winners among my favorites. Personal preference, I suppose. 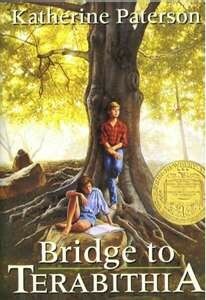 Yet there is much I admire within Bridge to Terabithia. And some I wrestle with. Written in 1977, it captures the flavor of the 70’s. To those of us who grew up in that era, it is nostalgic. For younger readers, it’s a time capsule waiting to be opened. Yet Jess’s experiences transcend decades. For this is a story of friendship, placed in a glass bottle and examined from lots of angles, then dumped out and smashed. For this is also a story of loss. Jess lives a rough life. The farm hardly supports a family, yet his dad struggles to find work. His two older sisters are selfish, lazy snobs; his two younger sisters are obnoxious tag-alongs, which leaves Jess to bear the brunt of chores. Enter Leslie Burke. After a rocky start, Leslie, with her imagination, her frank honesty and her love of life, demonstrates a new kind of friendship. Not like at school, where the guys compete to be the best and battle for control, but friendship based on mutual respect and acceptance. With Leslie, it’s okay for Jess to be less than brilliant. It’s okay that he’s not the fastest runner in the fifth grade. It’s even okay for him to be afraid. Together, Jess and Leslie create an imaginary kingdom of Terabithia that becomes for Jess a highlight in his imperfect world. It’s their secret; special, guarded and precious. Yet Jess’s newfound joy mingles with tragedy. In conclusion, Bridge to Terabithia provides a sweet tale based on the true, tragic events of Mrs. Patterson’s son’s childhood. One that gently illustrates the joys of friendship and the heartache of loss. Note to parents: This book is well-written, but consider your child’s age and sensitivity. Also, it does contain some mild swearing. Loved this book as a kid (seeing the publication date, I must’ve read it not too many years after it was published… did I just date myself 🙂 ) Interesting to see your comments and to think about what we pick up as young readers. I really only remember the adventure of the story, being away from everything and having a sanctuary. And of course, being very sad at the end. When I started teaching Freshmen Language Arts, I bought a “banned books” poster and was surprised to see this book on the list. I don’t ever remember being struck by the “controversial” issues presented in the challenges. But I had a pretty laid-back religious upbringing. Anyway, thanks for the memories. I’ll have to check out your 13+ reviews and tell my students about your site. Patterson does write brilliantly, even if she isn’t a personal favorite of mine. The book is so worth reading, even with the controversy. I had a strict religious upbringing, and I raise my kids the same way. But we read this together and it provided so many discussion and thinking opportunities! So I’m guessing most of my fiction writing won’t be your cup of tea, but hope you would check by when I post something other than fiction. (Thanks for your comments on my White Men Can’t Write… or Rewrite post. I replied to them there). And I think being in a pretty conservative area myself (Southern Utah), many of my students will appreciate the chance to find a good site like yours. Thank you for the compliment. I’m heading back to your blog right now. Horror doesn’t really appeal to me, no, :), but the several blog posts I read were well-thought-out and intelligent. I’ll definitely be popping in again. And I’ll see you around Book Blogs!